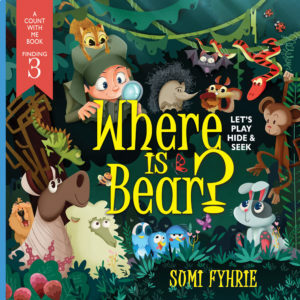 Where is Bear?- Let’s Play Hide and Seek by Sumi Fyhrie – Available Where books are sold. Adam explores Bear’s cave that is dark and small. Help Adam find Bear in this fun, playful adventure. Delightful illustrations and rhyming text engage young readers. Perfect for pre- and emerging readers. Hidden inside are things in threes. Can you find them all? Look inside and see.